This year marks (only) the 90 year anniversary of women earning a basic human civil right: the right to vote. Women’s Rights: How Far Have We Come? Because of this existing discrimination, I want to share a message about our 90 year anniversary that has been continually circulated via the internet this year. I have been unable to locate the document’s original owner, but hope that I can one day credit (probably her) for her hard work. The document is entitled “Only 90 Years Ago They Were Jailed,”and although it is a mere 2 pages – it will, like it did me, rock me to my core and appropriately remind me of how important it is for me, as a woman, to vote. 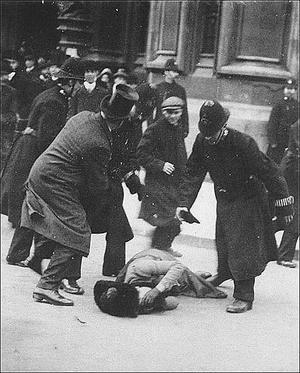 Photo: A woman is struck down during a suffragette demonstration in 1903.